These pillows are wonderful. I bought 2 sets and only needed one. They are soft yet high enough to use only one, where I had to use 2 before. The guest room now has new pillows too! Each pillow in this fabulous set of two pillows features a two-inch gusseted sidewall-configuration, which cradles your head and shoulders while aligning your spine for a more natural sleeping position, allowing you to receive a more recuperative night's rest. The 200 thread count-cover uses SoftLOFT fiber to ensure a pleasant texture, and Nanotex to regulate temperature, allowing you a perfectly cool rest. 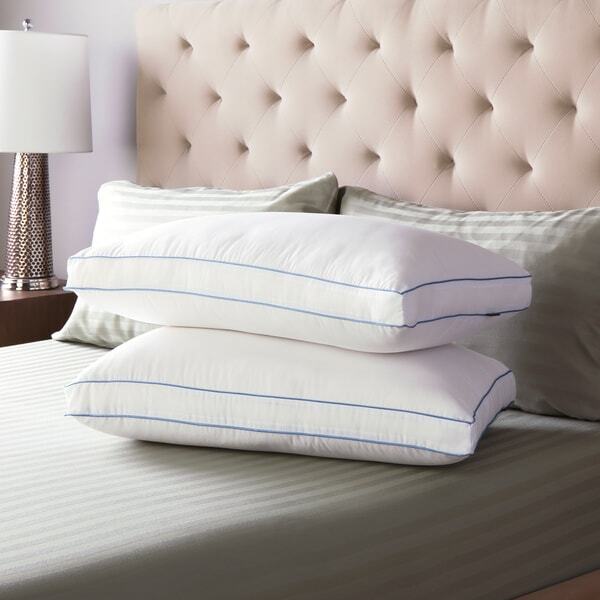 Comfortable and restorative, these pillows will make your bed your favorite place. After 20 yrs of deployments in the USAF, I really need head/spine alignment to get a restful sleep. These pillows allow me sleep in comfort and wake up ready to go again. Thanks, Overstock!!! I'm a customer forever!!! Dream Perfect! Great support, soft yet firm. Two hours into my sleep and I dreamed that I was floating on a cloud above paradise. When I awakened I was well rested and delighted to start my day. Greatest pillows ever! I wished I could have had these pillows available during my first 73 years here on earth. God Bless the makers! I received my two pillows about 3 weeks ago. So far they are holding their shape and firmness, while being comfortable to sleep on. Just received them yesterday. I bought 4 to replace the flat as a pancake pillows I bought from Amazon (who I will never purchase from again), and I really like them so far. Of course I was also replacing my standard size pillows with Queen size pillows because I had so much extra space on my bed. They're great so far I think I'm really gonna like them. Perfect thickness and support and I'm someone with a back injury. I actually broke my sacral spine, hip and injured my neck so you can imagine that comfort doesnt come easily for me. Not as firm as I had hoped, but good quality and I can clean them in the washer. I would recommend them. Very pleased with weight and size of these pillows. Looked hard for queen sized pillows that were affordable. I bought four so that two could be used in my shams. They filled them so much more nicely than anything else I've used. My shams don't look limp now. These pillows are FABULOUS!!! They are super comfy yest not too firm but firm enough! I will definitely be purchasing more and have recommended these pillows to several family members and friends!!! Nice set of pillows, hold it's shape, very comfortable. These are somewhat firm, but not extra firm by any stretch of the imagination. They are quite thick, so just like the "Firm Density" in this line, your head sinks into the pillow too much to be truly comfortable. I love these pillows! The extra firm is perfect for stuffing decorative pillow shams because they fill the sham out all the way and they stand up nice and tall. I use them exclusively for all my beds! Firmness, you can be comfortable asnd not have to constantly adjust the pillow all night. I have been enjoying these wonderful pillows. The pillows stay nice and fluffy after months of use... The stuffing and the fabric encasing it is of high quality. I would certainly purchase these again. I think this is the best pillow I have ever used. They’re full meaning works better with a sham because pillow cases fit a tad small. (Queen). Wouldn’t classify as firm at all—. I’m buying replacements for these. Awesome pillows. Thought they were going too firm but they are just right. Got a great nights sleep for the first time in awhile. They hold their shape and dont go flat. These pillows are large and will fill out a sham and hopefully not go flat. This will add the perfect finish to the room.